Take a good look. See how nice and bright green this pesto is. The taste is even better, thanks to pistachios. I’ve been making pesto almost as long as I’ve been cooking pasta, long before it really became popular. I made it for this traditional Genovese pasta dish. Then I noticed the whole world discovered pesto for everything and everything became pesto. Traditionally it’s always been made with pine nuts, which are actually the edible seed of a pine tree, but then something happened to pine nuts! No one knows for sure why, but a syndrome called pine mouth has been reported and packages now have warnings that “Some individuals may experience a reaction to eating pine nuts, characterized by a lingering bitter or metallic taste.” You can read more about that pine nut syndrome here. For a while, I substituted with walnuts. Recently I discovered that pistachios yield a result much closer to the pine nut version, as they equal the flavor and texture of pine nuts (with no fear of losing my good taste buds). The pistachios provide enough heft and flavor to make my pesto turn out exactly the way I like it. It also retained its bright green color, as often walnuts will muddy the color. I know that pesto can be made mortar pestle style, but I’m going to show you my easy way. I use a small food processor that I can control. I just purchased this immersion blender that came with a mini-food processor attachment and it worked like a charm, because I like it with a bit of body. You can put it all in a Vitamix type blender, but I like a food processor for pesto. The store bought pestos are usually all wrong in so many ways, and I urger you to avoid them. They are often weak substitutes with overpowering garlic and a metallic taste. It only takes a few minutes to make your own and it’s so worth it. Garlic: How Much? Many recipes require way too much garlic and it becomes a garlic pesto. You may say you love garlic, but try my way once with only two small cloves and see how bright and fresh your pesto will taste. Butter: Yes, a few tablespoons of butter lends to a very creamy texture. You can leave it out, but once you add butter, you will experience a whole new kind of pesto. Cheese: I often use a combination of freshly grated parmigiano reggiano and Pecorino Romano. It’s all good and a matter of preference. The Romano cheese (a sheep’s cheese) is saltier and in this recipe that’s all I used. But feel free to mix it up. Basil: If you wash the basil, dry it well in a salad spinner or with paper towels. If you’re short on basil, add in fresh Italian parsley. Storing Pesto: You need to refrigerate pesto. Take it out 30 minutes before using. You can also see notes for freezing. Once I have my pesto completed, I always freeze some, especially since I grow basil and have it in abundance this time of year. I’ve seen people freeze pesto in ice cubes, but I like to use these silicone cups, especially these from OXO because they have side handles, which makes them easy to cart when full of liquid. After they are completely frozen, I place them in a food saver bag or ziplock. Just take out and defrost. Presto, pesto, you have a fresh batch. 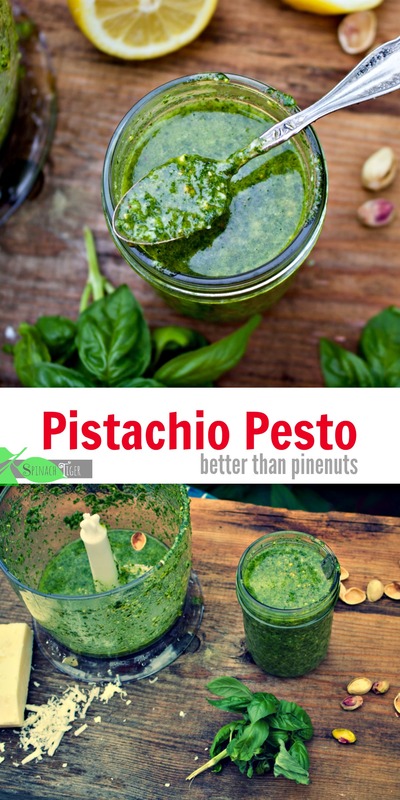 How would you eat Pistachio Pesto? While pasta is an obvious choice, this is low carb by itself. Simply add to veggies, steak, fish, zoodles, soup. If you’re splurging, try pistachio pesto on smashed potatoes? It’s amazing. It will also perk up polenta and be an amazing appetizer on tuscan toast points. 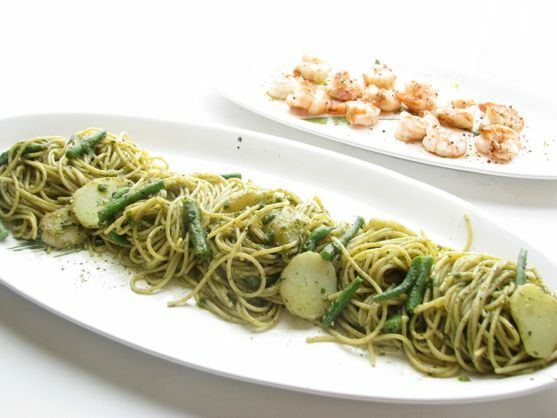 This traditional genovese dish is one of the ways we love to eat pesto with pasta. 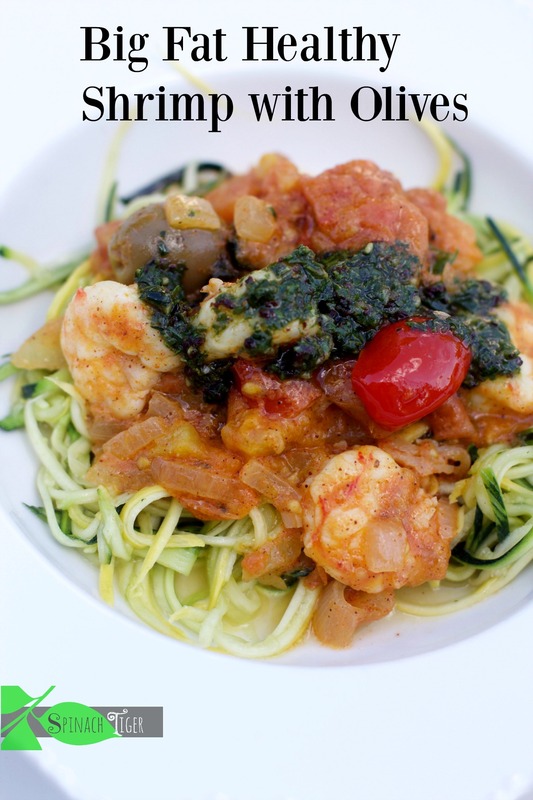 I love this zoodle shrimp dish with tomatoes and spoonfuls of pesto. 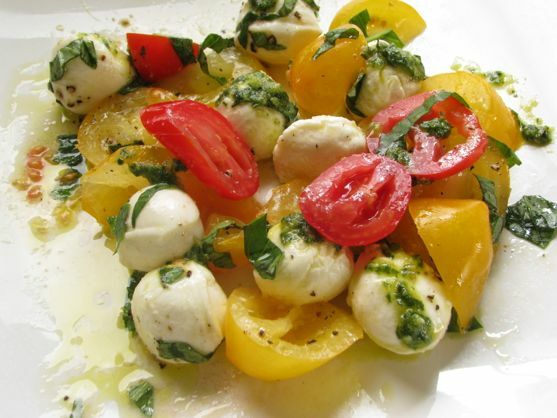 You can always add pesto to pizza or to a caprese salad. 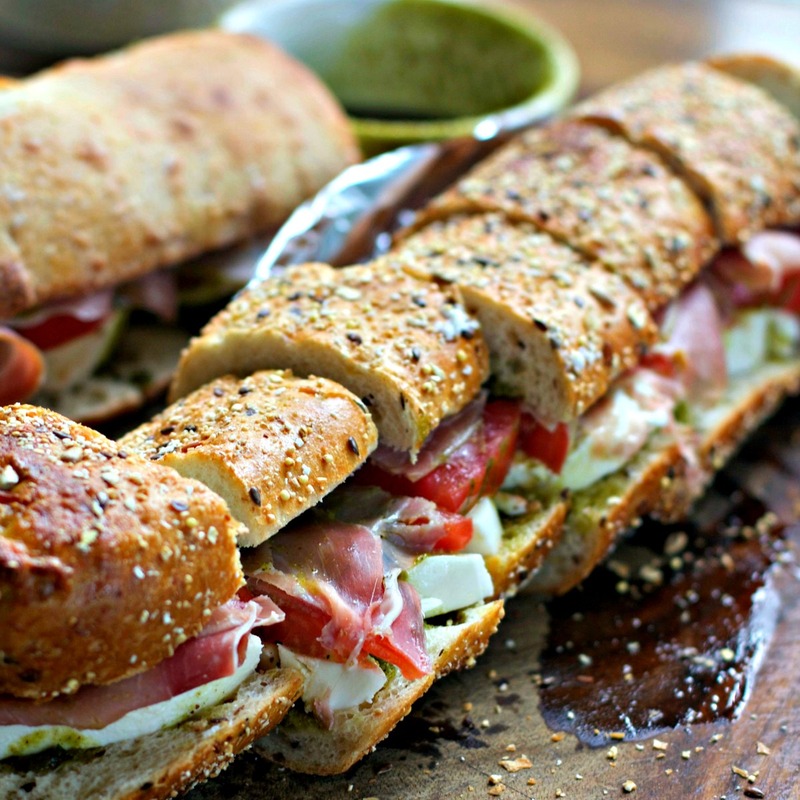 Pesto is awesome in sandwiches like this big fat party sandwich. 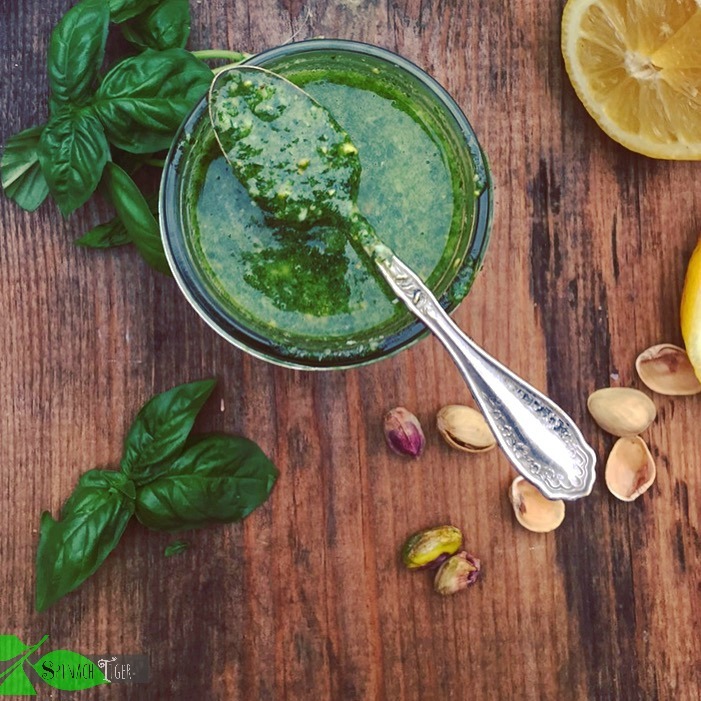 Fresh basil, pistachios, lemon juice make a delightful summer pesto, which can be frozen and enjoyed in the winter. Place all ingredients except cheese into a food processor. You must chop the garlic first, which makes it much better to process and doesn't become a juice. I don't like to use a food processor for this because I can pulse it and keep some texture, which I prefer. Add the cheese by hand. Regarding cheese, sometimes I just use pecorino romano. You can also use parmesan cheese. If you are adding this to pasta, reserve some pasta water (3 tablespoons or so) a little at a time to extend the pasta. You may also heat the pesto on very very low and add in heavy cream for a creamy pesto pasta. This post contains affiliate links which help to keep Spinach Tiger operating. Except for the pistachio for pine nut substitution and garlic your recipe is identical to my mother’s. She did not like garlic so she did not use it. I put in one clove for my pesto. I will try the pistachio’s on my next batch. 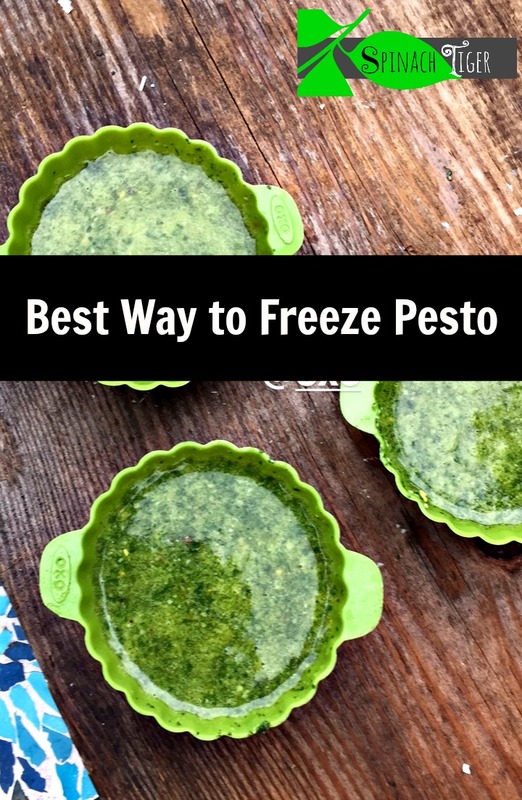 I use a plastic ice cube tray to freeze my excess pesto and transfer them to a zip lock bag once they are frozen.